The frozen surface of Jupiter's icy moon Europa is seen in extreme detail in this remastered photo made from images taken by NASA's Galileo spacecraft in the late 1990s. A new study suggests that the ice on Europa may move between the moon's poles and its equator. Ice on Jupiter's moon Europa may drift across the satellite's surface from the equator to the poles, or vice versa, at a literally glacial pace, a new study finds. 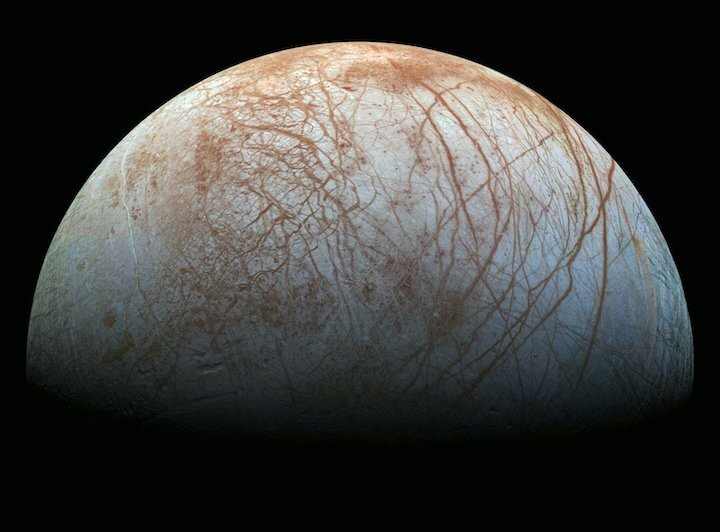 Potential future missions to Europa could analyze this ice flow to discover hints about whether the ocean hidden under the ice's surface might be warm enough to support life, researchers said. Europa is nearly the size of Earth's moon. Under an icy shell up to more than 18 miles (30 kilometers) thick, Europa may possess an ocean perhaps about 100 miles (160 km) deep, scientists have said. Since there is life virtually wherever there is water on Earth, Europa may be one of the most likely places in the solar system to find extraterrestrial life, said the new study's lead author, Yosef Ashkenazy, a climate dynamicist at Ben-Gurion University of the Negev in Israel, and his colleagues. The study was detailed Dec. 4 in the journal Nature Astronomy. Europa's icy crust shields the moon's ocean from view. However, clues about how this underground ocean behaves might be deduced from Europa's surface, especially regions known as chaos terrains, where ice has warped and broken into jumbled blocks. These strange areas cover up to 40 percent of Europa's surface, clustered mostly around the Jovian moon's equator. Prior work suggested that this chaotic terrain resulted from churning within the ice, causing blocks of it to rise vertically. Now, Ashkenazy and his colleagues have analyzed how this ice might also move horizontally across Europa's surface. Previous research suggested that ice may vary in thickness across Europa's surface because the moon's poles are much colder than its equator. The differences in thickness could help drive ice to drift across Europa's surface, but until now, scientists had not studied how this flow might behave. The scientists developed a model of Europa's shell composed of warm, soft ice flowing beneath a cold, brittle, rigid ice crust, a bit like how Earth's crust possesses hot flowing rock underneath colder, even more brittle rock. Underneath Europa's crust, the model also simulated an ocean heated by a warm core and by friction generated by Jupiter's gravitational pull. The model found that if Europa's icy crust was thick enough, temperatures would vary enough within the underground ocean for a kind of churning known as convection to occur. "In Earth's atmosphere and oceans, convection is a quick process, but with the ice of Europa, it would occur over the timescale of millions of years," Ashkenazy said. If convection occurred within Europa's ocean, heat could flow from the equator to the poles, enough for the equator to become significantly cool compared to the poles, he said. "In this scenario, ice would flow from the equator to the poles," Ashkenazy said, because the ice at the equator could be miles thicker than at the poles. However, if Europa's crust is relatively thin and convection does not occur within its ocean, the poles would be much colder than the equator. "This would lead to warmer ice at the equator and thicker ice at the poles, and the pressure gradient would lead ice to flow from the poles to the equator," Ashkenazy said. The rate of ice flow would be very slow, on the order of about 0.4 inches (1 centimeter) per year, Ashkenazy said. Still, future missions to Europa could look for signs of this ice flow by measuring how thick Europa's crust was at different points across the moon's surface. Doing so "can help improve our understanding of what's going on beneath Europa's surface," Ashkenazy said.